We arrived in Kathmandu on Wednesday night, May 7, just before 9:00 local time. It was 11:30 before we got our baggage and walked out of Tribhuvan International Airport. We were met by CRI and taken to a Christian guest house for the night. All of us slept in the same room. Beds were comfortable and it was wonderful to stretch out after more than 20 hours in three different aircraft. The fan rattled badly but David found a way to fix it. It was very hot; we needed that fan! The Internet didn’t work but we wanted sleep! In the morning we were told we were being deployed to Sindhupalchowk. There was no discussion, no suggestion that we might have an idea where our skills would be most useful. As a group we decided to see where this might lead and proceeded to load a couple pickup trucks with our stuff along with some bags of rice and instant noodles (Wai Wai). We went shopping in Patan for more supplies. First stop happened to be near Patan Darbar Square where several ancient structures had colpased. The clean up had begun and we were not allowed in the area. Nearby we were able to buy plastic buckets with lids for the Swayer water filter kits, a couple cooking pots and bowls for ourselves, snacks, oatmeal and coffee. Later we stopped to pick up several more bags of rice. Both trucks were quite full. The last stop before heading out of the Kathmandu valley was to buy SIM cards for our phones that would work in Nepal. Hannah, a Nepali Christian girl, came with us as a translator for CRI personnel in Sindhupalchowk. 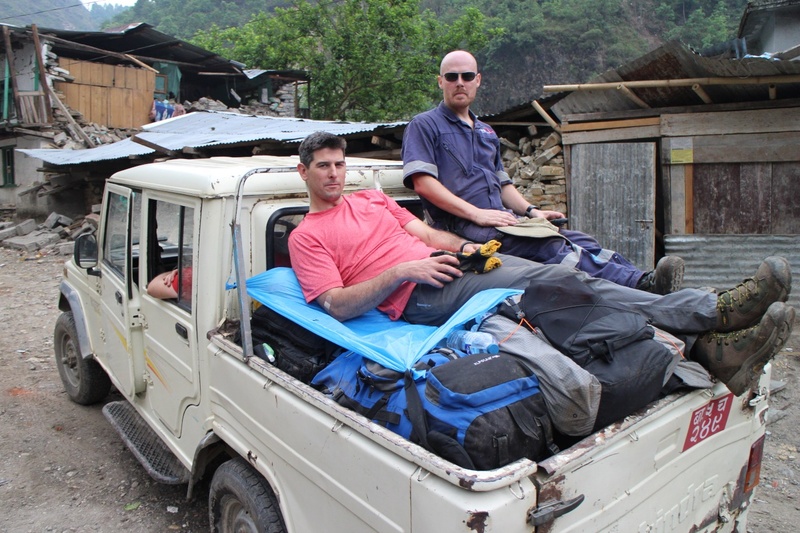 There were also two hired drivers with trucks that belonged to a church in Kathmandu. One truck had “Jesuse Love You” in English across the front windscreen. David’s Nepali was coming back. It is quite amazing how the mind digs up the words when you’re in context. He did a lot of the negotiating in the shops. It was fun to watch! As we drove around Kathmandu we noticed that the city was very much back to normal. We saw evidence of collapsed walls along streets, but most had been cleared away. Traffic seemed light. We speculated that many vehicles were outside the valley either taking people out of the valley or were being used to transport relief supplies. Shops were open and many people seemed to be living inside again. People were going to work. As Robert Frost said ‘Life goes on’. Outside the city, as we drove east, we didn’t see much damage initially. We travelled down to the Sun Kosi River and then north along this river toward Kodari, at the Chinese border. The farther we travelled up the river, the steeper the sides of the valley became and we saw more damage to houses, landslides and boulders hanging precariously. At 3:00 we reached our destination – Chaku, a series of houses along the road. When we got out of the trucks we had no idea where we were supposed to go or who would meet us. As we stood waiting for phone contact, we noticed that it was basically a ghost town. Soon a small group of foreigners came up a side road from the rest of the village. They welcomed us as part of the CRI team and showed us where to park the trucks. The houses along the road, they said, had been abandoned. 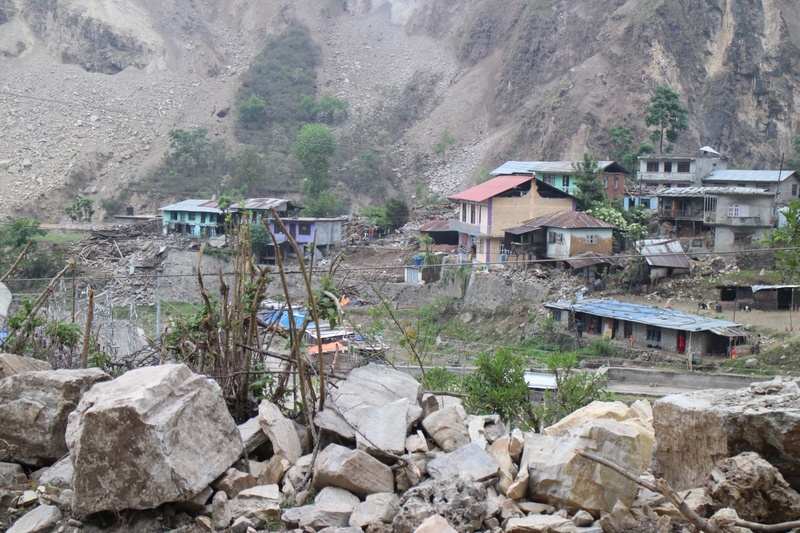 Their owners had returned to villages high up in the mountains because they felt safer up their away from the possibility of landslides in the steep slopes by the river. What many of them found on returning to their villages, however, was that their village homes had collapsed. But on higher ground they could, at least, set up temporary shelter in open ground and they could take care of their animals and fields. Many villagers rented or build houses for shops of some kind along the roads where members of the family could generate cash income. Those who stay back in the villages continued farming and raising animals. The lower part of Chaku village where the original residents live. 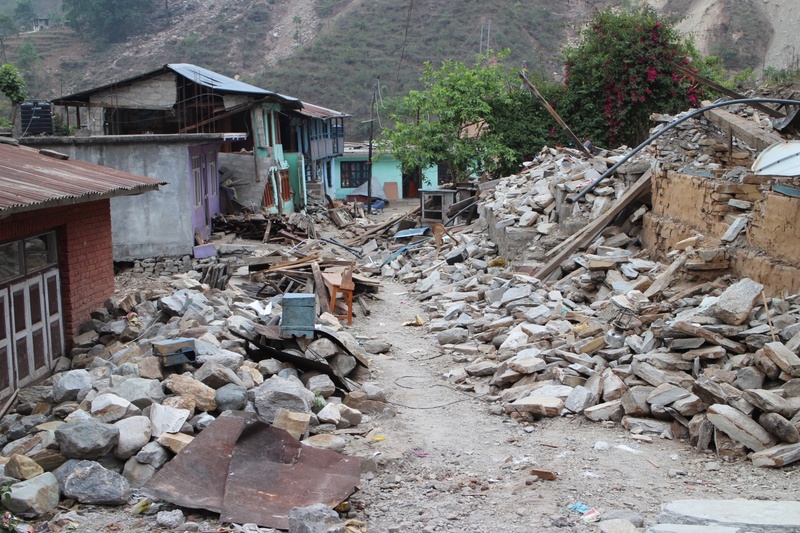 The CRI team of three women and four men had been in the village 5 days. Among them was a nurse, two young EMTs from Texas, a volunteer firefighter from Virginia, and three who called themselves CRI co-leaders. Soon after we unloaded the trucks we had a meeting at the local church, one of the only buildings in reasonably good condition since it had recently been build of concrete and rebar. We heard that they had re-established a water supply for the remaining villagers, the original settlers of the area who had lived here before the motor road had been built. Their settlement was below the road on an extended ridge between two streams. It soon became clear that the CRI team had not done much and the primary focus of the co-leaders was to work with the pastor of local churches in this and surrounding villages. They were waiting for the pastor of the local church to return from visiting other churches so they could assess needs. We were told we would not be able to visit any other villages unless we were invited by its local church, that the pastor of that church accompanied us and one of the CRI co-leaders also accompanied us. We took this information in silently but we each realized it was going to be difficult finding a way to use the energy we had brought to this place. After this meeting we newcomers were invited to set up camp in a field next to the one the others were camped in. 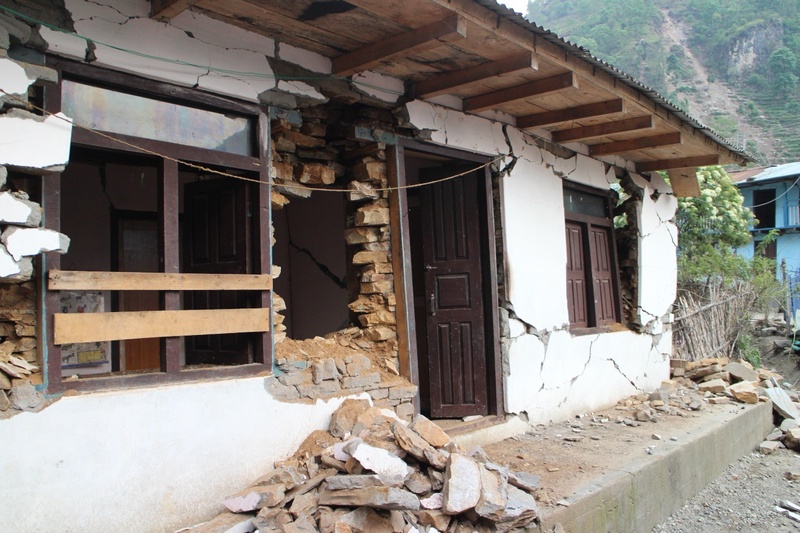 It was well away from any houses and also away from the danger of landslides and falling boulders. 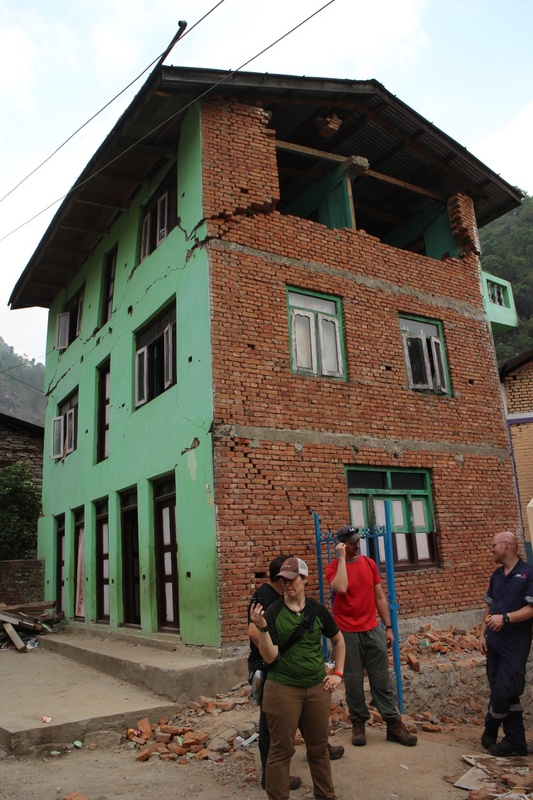 After pitching the tents we walked around the village to assess damaged houses. David and I talked with several local people. Because of our language ability, we immediately established a rapport and learned that the primary need was for a clinic. Even though seriously injured people had been transported out to hospitals by road, others needed dressings changed or had various “routine” complaints. We discovered there was a local pharmacy but no villagers had cash to buy needed medicines. There were no real medical emergencies here any longer. The people would need continuing medical attention the longer they stayed in temporary shelters. After an aftershock that evening the top corner was even more precarious. There were several houses posing a critical danger along the street. Walls could collapse at any time. We debated the risks of brining them down completely. We spoke to the owners who were eager for us to do what we could. Standing as they were was of no use to them; they were too dangerous to enter and posed a danger to everyone until they collapsed completely. We thought we could bring one house down relatively safely. There were no buildings below it but on a closer look we noticed a row of houses was leaning against it. We could not speak with the owners of these building because they had left the village. We could not proceed without their permission. 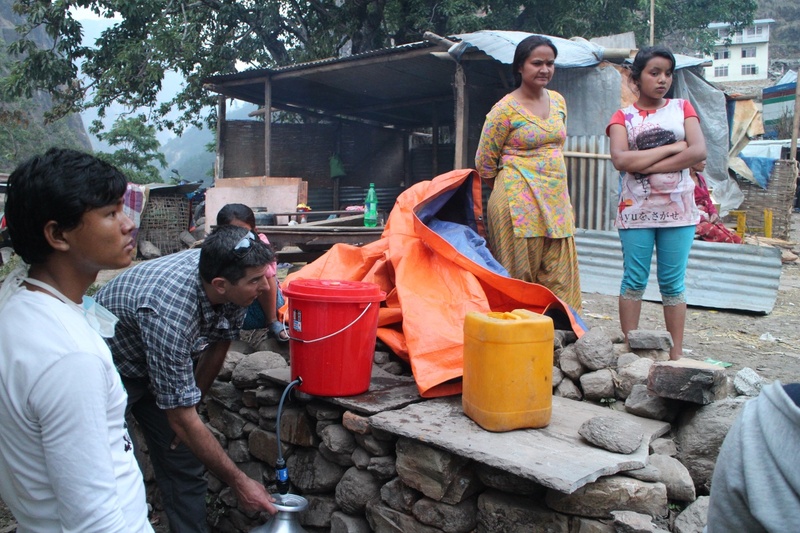 One thing we were able to do was distribute five Sawyer water filters to family groups camped in open spaces away from the broken buildings. We put a hole in the side of five buckets and fit the filters. When we set them up we made be sure the women knew how to use and clean them. Demonstrating a Sawyer water filter. That evening after a meal prepared for us by the local church, the three CRI co-leaders called a meeting. This consisted of twenty minutes of singing songs, praying and then sharing what we had done that day. It became clear to us that the leadership really had no idea of what to do; they were completely reliant on the local pastor who was away. During that meeting we were not consulted nor were we encouraged to present any ideas we might have had. We felt frustrated. Later that evening, after discussing amongst ourselves, we met with the co-leaders to ask directly what we would be able to do. We suggested visiting other villages and setting up a medical clinic but these ideas were not encouraged. We were told that since the following day was a Saturday, the day of rest and worship for the local church, we would be required to respect this situation. We would be expected to attend the church service and stay in the village. We would have to wait for the pastor to return. The ineffective leadership frustrated us and we decided to discontinue our relationship with CRI and go with our original intention to work in Gorkha district. We realized CRI really had no track record in Nepal and no real understanding of the culture or situation of the people. Loaded for the return journey. The next morning we packed and loaded up a truck. Our exodus sparked three others to leave, too. The two Texans and the Virginian who had come with the CRI team were as frustrated as we were. Besides setting up the water supply system and helping people remove belongings out of the rubble of their houses, these young people had done nothing for five days. They wanted to join our group. I called Tulsi Gyawali, my travel agent friend in Kathmandu with Nepal Sanctuary Treks, to send a van to meet us in Barabese, about an hour’s drive down the valley. There were too many of us to go in the pick up truck so it made two trips to Barabese. Our original group went first then it returned for the Texans and Virginian. We all arrived in Kathmandu in the late afternoon. David and I went to our friend’s place while the rest went to an Air B&B that Heather Knight arranged. Ron Hess and Cheryl Groff, our friends from my childhood at Woodstock School in India, live in a very nice, strong house that had survived every earthquake and tremor so far without a crack. We felt safe and they fed us a great meal. After showing David around our old neighborhood in Sanepa, Ron showed me the UN coordination website that list every village area in the effected areas. Each cluster group oversees health or shelter or food distribution. NGOs are assigned to operate in different districts. In effect, it showed that the UN had taken over the job of coordinating relief and rebuilding efforts by working with the Government of Nepal. We later had first hand experience of this process. What we learned from this experience was that working with NGOs that had little or not track record in the country was both ineffective and inappropriate. It is important to connect with established NGOs such as World Vision, Mercy Corps, Save the Children. Making contact with the government also gives legitimacy at the local level to your presence in rural areas. From what we observed, CRI wanted to work only through the Nepali Church.